As the old saying goes, the only constant in life is change and that has certainly been the case recently here. It is true in any aspect of life, but it seems even more so in the church. I have had the opportunity to be part of a few changes in our fun little Rootstown Ward these past few weeks that I thought I'd share! The first was just over two weeks ago with the baptism of one of my sister Katie's best friends, Caitlin Vanderground. Caitlin, known mostly by her nickname "Gizmo," met Katie when they both worked at Camp Ledgewood (a Girl Scout camp in Peninsula, Ohio) for a few summers. It's always a neat experience to see someone learn about the church and then decide to join by way of baptism, but even more so when it's someone you've known for a long time! Granted, I haven't known Caitl in that long and for the most part our meetings have been in passing when she has come over to visit Katie at various times or when we saw each other at Bowman Hall on the KSU campus. I didn't even know her real name until just recently, plus it took me forever to figure out which one was "Gizmo" and which one was "Re-run" (another camp friend). I would just lump them together ("Gizmo and Re-run"). Caitlin started meeting with our wonderful sister missionaries a few months ago after she started attended church with us in February. I'll never forget it because Caitlin came with her "Mormonism for Dummies" book and was reading and checking it during much of the meeting. I thought it was cool. I didn't really do much with the discussions (the missionaries teaching) since I didn't really need to. Katie is also a former full-time missionary, plus the missionaries we have had here do such a great job relating to people and teaching them. On top of that, my relationship to Caitlin is much more of a casual one, so no need for me to crowd the discussion! Honestly, I thought Caitlin might join the church down the road, but I never expected this. What a wonderful surprise! I know it made my sister Katie incredibly happy too! To add to my surprise, Caitlin asked me to baptize her, which I did. I hadn't actually baptized someone since 2003 when I was on my mission. It's been awhile! The baptismal service went well and I thankfully didn't mess up the actual baptism either! The next day Caitlin came to Kirtland with Katie, me, the missionaries and some friends from church. We had a lot of fun seeing the sites again (we'd all been there before) and seeing the Joseph Smith movie. It's pretty good! In other news I officially got my new calling at church. I found out last week (April 20) that I was being relased as pianist and called as the teacher for the 10-11 year olds. I was pretty disappointed to be released as pianist as it has been the best calling I've ever had. I don't think I've ever had a bad Sunday since I've been pianist, even when I've struggled with some of the songs (which happens frequently). I was sustained in sacrament meeting this past week, though I have not officially been released as pianist yet. Even if I am formally released, no one has been called to replace me, so I will still be acting pianist. Because Primary is divided into two one-hour sections, known as Junior Primary for the 3-7 year olds and Senior Primary for the 8-12 year olds) I won't be able to play during Junior Primary because that's when I'll be teaching my class, though there is a possibility we could go back to having just one Primary, in which case I would be able to play piano for. In addition to my new calling, there were several changes in our ward as we got new presidencies in both Primary and Relief Society (women's organization). In fact, our new Relief Society president had been the Primary president (go Sister Horning!)! We also got three new teachers in Primary (including me). I'm excited to be a teacher again even though I will greatly miss being full-time pianist. I haven't been a full-time Primary teacher since 2004 when I taught the class with the 6-8 year olds (all of whom are now almost 12). I'm hoping I can apply more of what I know about teaching into my class and use more resources to make it more interesting. We'll see how it goes! Notes on pictures: 1. 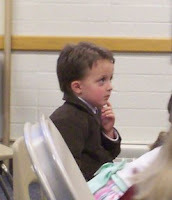 Oliver Lamprecht, age 3, in Junior Primary pondering a question on April 21; 2. Caitlin and me just before her baptism on April 20; 3. the group in Kirtland, Ohio inside the historic Whitney house; 4. Me happy behind the piano in Primary! !